Over the last two seasons we have seen the dynamic duo of Randy Moss and Wes Welker set records for the Patriots. It seemed it couldn’t get any sweeter for The Patriots. But now, they have picked up a long time NFL great wide out Joey Galloway, Galloway is known for his incredible speed and big catch ability, and seems to be a great match for this squad. You would have to be a moron to argue the fact that this team is now stacked with a bonafide WR triple threat for the ages. They have Pro-bowl caliber WR’s from 1 through 3 and I really can’t recall when any other team was this stacked as they are at WR. Say what you will about Galloway’s old age and recent surgery at the end of last season, he still was the most explosive and fastest WR on the Bucs at year’s end. This season everyone should fully expect Brady to have a monster season as long as his knee can hold up. I am interested to see how that chump holds up! 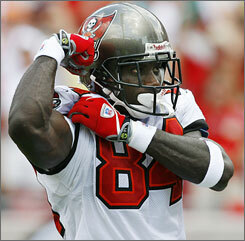 Randy Moss & Wes Welker will soon be united with Joey Galloway!